This is yet another activity from our Activity Advent Calendar, inspired by similar activities at Come Together Kids and Little Pumpkin Grace. I made a special North Pole Breakfast on Saturday morning. 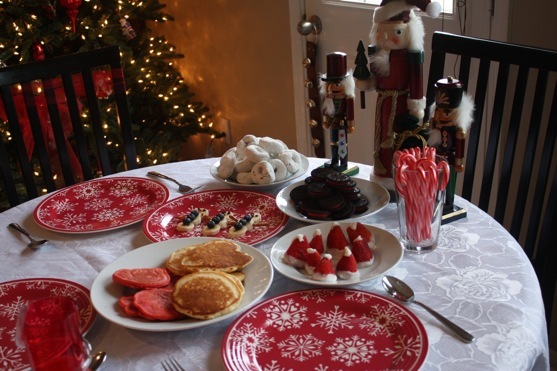 We aren’t doing Elf on the Shelf this year, but a breakfast like this would be a great way to kick off the Christmas season with your Elf’s first arrival. Or a great way to kick off the month of December, period! Before we even get to the menu, it was very important to me to make this a “special” breakfast with a tablecloth, decorations, and special cups and plates. 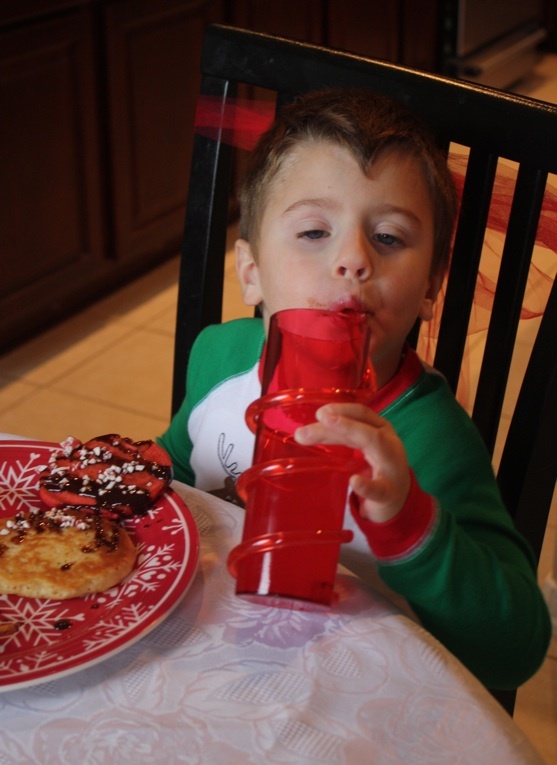 However, the only NEW items I purchased were the red and white snowflake plates and the fun cup (from Target). I spent around $10. Since The Littlest Apple is very interested in Nutcrackers, I included the 3 we own on the table. 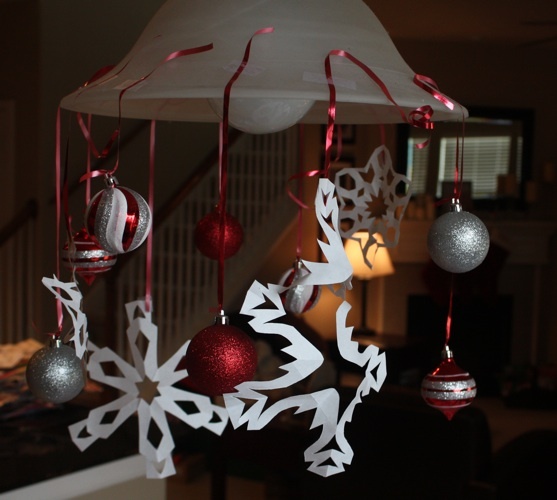 I recruited my husband to cut out some snowflakes which I hung (okay, taped haphazardly) from the light fixture along with some red and silver ornaments. I also tied some red tulle to the back of the chairs. I did all of this late the night before the breakfast, and The Littlest Apple was SO EXCITED when he came downstairs and saw the table all set up. He couldn’t wait to wake Daddy up to have breakfast. 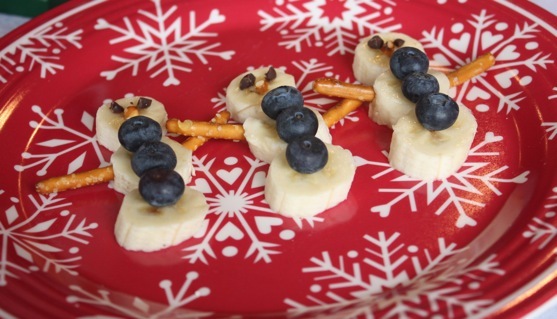 I think these few little decorative touches really made our North Pole Breakfast extra special. There were also some candy canes and Winter Oreos on the table just for kicks. It didn’t take very long to throw this all together. The most time consuming part was the pancakes, and you could prep the batter the night before. 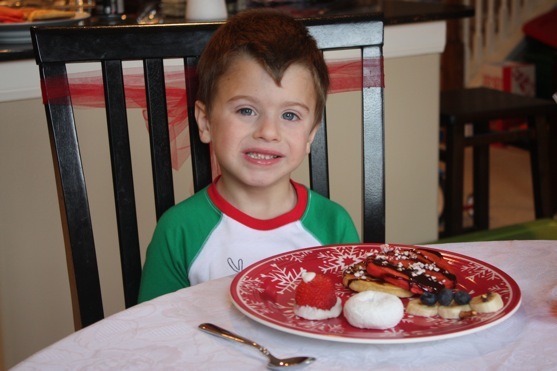 Here’s the recipe for those yummy pancakes…. Whisk together the flour, sugar, baking powder, baking soda, and salt in a large bowl. In a separate bowl, whisk together the egg, melted butter, and then the buttermilk. Make a well in the center of the dry ingredients, pour the buttermilk mixture into the well, and whisk very gently until the buttermilk mixture is just incorporated (a few lumps should remain). 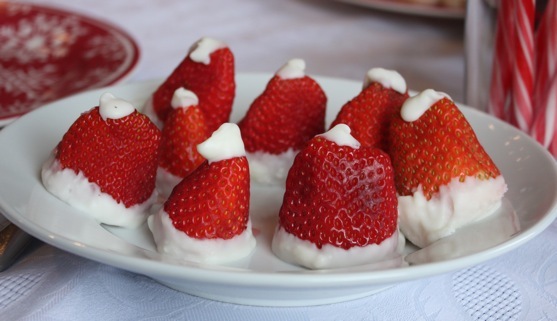 Pour half of the batter into another bowl and add red food coloring until you reach your desired color. Heat a 12-inch nonstick skillet over medium heat for 3-5 minutes. Brush the pan bottom with 1 teaspoon oil. Using 1/4 cup of batter per pancake, add the batter to the skillet (only 2 or 3 pancakes will fit at a time) and cook until large bubbles begin to appear, about 2 minutes. Flip the pancakes and cook until golden brown on the second side, about 1 1/2 minutes longer. Repeat with the remaining batter, brushing the skillet with oil as needed between batches. 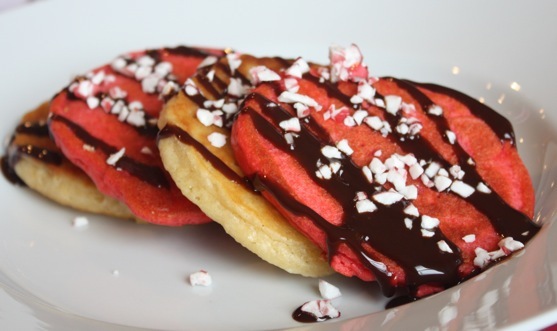 Serve alternating colors of pancakes topped with chocolate syrup, crushed peppermint candy, and whipped cream.